"I played much better tonight than I have since I started this journey on my way back," said Serena, although she wasn't sure she'd agree with Venus's assessment that it was the best match she'd ever played against her sister, reports AFP. "I think it's by far the best match I ever played against her in forever," she said. "But I don't know about ever, ever." Either way, the scoreline equalled Serena's most lopsided victory over Venus, and took her head-to-head record against her sister to 18-12. "She played so well, I never got to really even touch any balls," Venus said. "I don't think I did a lot wrong. But she just did everything right. "Obviously that level is definitely where she's going to want to stay during this whole tournament. "It feels good for the match to be over with. 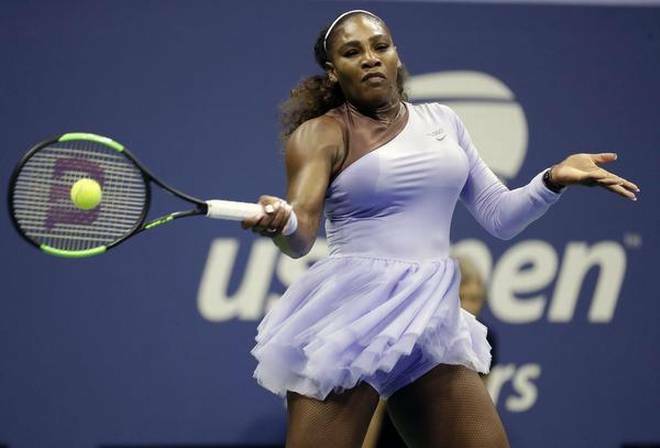 Win or lose, it just feels good that that's done," said Serena, who showed none of her usual ebullience on court even as she belted 34 winners and 10 aces. "It's not easy," Serena said of facing Venus. "She's my best friend. She means the world to me. Every time she loses I feel like I do." But she looked every inch a contender to claim a record seventh US Open crown that would see her equal Margaret Court's record of 24 major titles. The Estonian, who toppled world number one Simona Halep in the first round, defeated Sweden's Rebecca Peterson 6-3, 7-6 (7/3). Both players had a chance to leave the court and the break refreshed Stephens, who came back to win the last three games in the "super-cool" atmosphere of the closed stadium. "It kind of felt like a night match with the lights on and everything," said Stephens, who said the break allowed her to "refocus". "I played much better the last three games," she said. "I competed. When things got tough, I just hung in there, battled as hard as I could, ran down every ball." Seventh seeded Ukrainian Elina Svitolina beat China's Wang Qiang 6-4, 6-4 to set up a meeting with Latvian Anastasija Sevastova, a 4-6, 6-1, 6-2 winner over Russian Ekaterina Makarova. Eighth-seeded Czech Karolina Pliskova advanced with a 6-4, 7-6 (7/2) victory over 19-year-old American Sofia Kenin. Pliskova, the 2016 US Open runner-up, rallied from a break down in the second set to secure the victory and set up a meeting with 22-year-old Australian Ashleigh Barty. Barty is through to the fourth round of a Grand Slam for the first time after a 6-3, 6-4 victory over Karolina Muchova, the Czech who toppled two-time Grand Slam winner Garbine Muguruza in the second round.